When I was a teenager, ghillying grandfather's tenants, I mentally divided them into two sorts: the ones who could catch fish and the ones who couldn't. Since you only need to cast as far away as the fish are, this meant that the fundamental distinction between the two groups was that the ones who did catch fish were good at field craft and the ones who didn't, weren't. Even now, when casting instructors are ten a penny and the days when guides were regularly presented with clients who couldn't cast a line to save their life are far behind us, the fact remains that sneaky fishermen with below average rod skills do much better than distance divas who scare every fish within shouting distance with an epic display of line flash. The reason for stating this before reviewing this book is that in recent years, I have come across a sucession of anglers who have become completely demoralised after taking lessons from instructors who have had a vested interest in making them feel underconfident in a skill which is only a small part of fly fishing. The trouble is that casting is the most visible part of fly fishing and so there is a strong tendency for folk to believe that if they aren't competition grade casters, they won't catch much. If you have such doubts, my advice is to quit worrying. Fish do not care what your line does when it is in the air, unless they happen to spot it - it is what you do with it after it lands in the water that matters and only a fool or a very lazy fisherman can go wrong with a modern fly line. I would, however, remark that it is interesting that we have lots of books on casting and hardly any on the control of the line once it is in the water. This may or may not have something to do with the fact that there is little kudos attached to being good at line mending, because other fishermen can't see it happening. None of the above is aimed at the authors of this volume, which is much needed in my opinion, given that there haven't been any books on the subject published in Britain for a while. A tenner gets you a nicely designed hardback with a printed cover, 96 pages in all and full colour throughout. 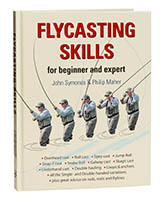 The illustrations must have taken an age to do, because virtually every one appears to have been cut out the hard way in Photoshop and painstakingly edited, but the result of this laborious process shows every key stage in making each type of cast and - assuming some experience of the basics of casting - virtually every fly fisherman stands to benefit from reading this book. I like the approach very much; it is simple, uncluttered and highly graphical. If you are having problems with casting, the answer is covered here. It might help readers to appreciate that there are only two main types of cast: the overhead and the roll cast, and all the other types are constructed by mixing different components of the pair together, but Flycasting Skills covers all the variations worth knowing, including the infamous Snap T. Depending on how you classify such things, this is a very useful variant on the Spey and it has been around much longer than many people are prepared to credit, given the natural tendency that anglers have to experiment. I remember the odd tenant using it as far back as the 1970s, in the days before every cast had to be given a name. Well executed, the Snap T looks fantastic, which accounts for its current popularity, but given that the most successful salmon fisherman I ever knew rarely used anything except a switch cast, it isn't essential to learn it. At the price, you really can't go wrong with Flycasting Skills and - just as long as you don't get hung up on the idea that you have to be able to make perfect casts to enjoy fishing - it really is the best book around on the subject right now.